With her striking magenta color design, she’s a real eye-catcher in the Port of Hamburg. With a length of 320 meters and slot capacity of 8,102 TEU (20-ft standard Containers) Ocean Network Express – ONE shipping group’s ONE Continuity may not be among the biggest containerships ever seen in the Port of Hamburg, but her unorthodox color scheme has everybody staring and cameras clicking. The ONE Continuity reached the Port of Hamburg on Friday, October 26, and was handled at HHLA’s Container Terminal Altenwerder - CTA. 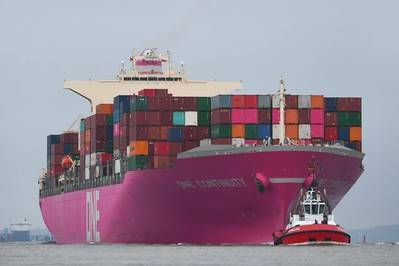 The rose-colored containership is deployed on ONE’s FE1 - Far East-Europe 1 liner service, linking Hamburg weekly with the Japanese ports of Kobe, Nagoya, Shimizu and Tokyo. Additional ports served on a weekly basis by FE 1 are Singapore, Jeddah and in Europe, apart from Hamburg: Southampton, Le Havre and Rotterdam. Ocean Network Express (ONE) is a Singapore-based global container shipping company that commenced operations on April 1, 2018. ONE merges the container activities of leading Japanese shipowners Kawasaki Kisen Kaisha - ‘K’ LINE, Mitsui OSK Lines – MOL, and Nippon Yusen Kabushiki Kaisha - NYK. ONE’s head office for Germany is located in Hamburg. For Japan, Hamburg is among Europe’s top ports. In 2017 a total of 1.3 million tons of goods were imported/exported between there and Japan. Around 99 percent of these are shipped in containers. In 2017 a total of 131,000 TEU were handled between Hamburg and Japan. That puts Japan in 18th place among the Hanseatic City of Hamburg’s top trading partners for seaborne container traffic. The most important goods categories dispatched by sea from Hamburg to Japan include timber products, paper and cardboard, plus metals and chemical products. The main imports from Japan arriving in the Port of Hamburg consist of vehicles, machinery and household appliances, along with chemical products. In the first half of this year the Port of Hamburg’s container traffic with Japan grew by nine percent. With the entry into force of the Free Trade Agreement between the European Union and Japan, for 2019 economic experts anticipate a distinct boost for mutual foreign trade. For the Port of Hamburg, abolition of existing customs duties and the opening up of markets will trigger a further rise in foreign trade with Japan.